The small town of Sringeri, amidst the lush green Western Ghats is one of the must visit places around Mangalore, Chikmagalur and Udupi. 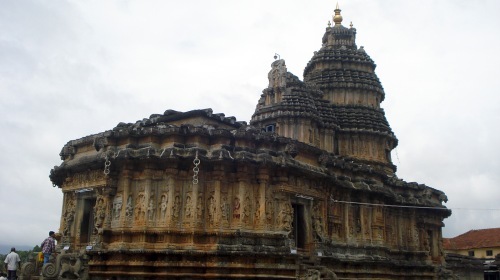 Being one of the popular pilgrimage centres of Karnataka, it houses the architecturally unique and magnificent Sri Vidyashankar Temple that incorporates the spectacular Hoysala, Chalukya and South Indian styles of temple architecture, and Sri Sharadamba temple, which is important to pilgrims. The Sharada Peetham was established in Sringeri by Sri Adi Shankaracharya, a Hindu theologian and proponent of the the Advaita philosophy, in about 8th century CE. He installed an image of Godess Sharada and began the propagation of his philosophy. Now, Sharadamba temple exists at this place. 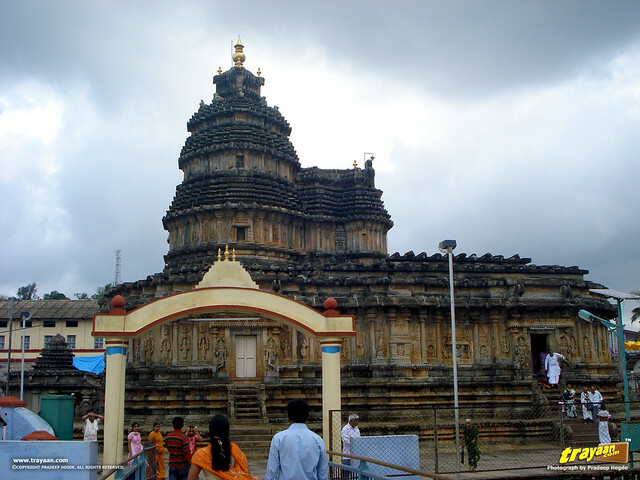 Sringeri temple compound houses the Sharada Peetham, with the Sharada Temple of historical significance and pilgrimage. 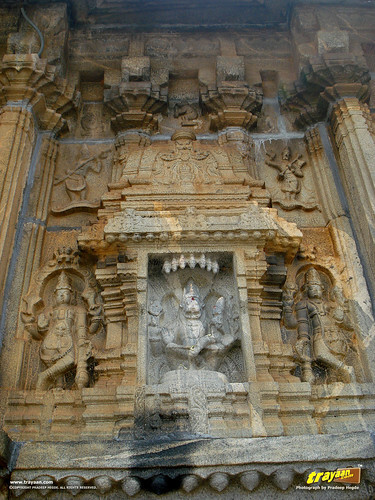 It also houses the historical and architecturally unique Vidyashankar Temple. 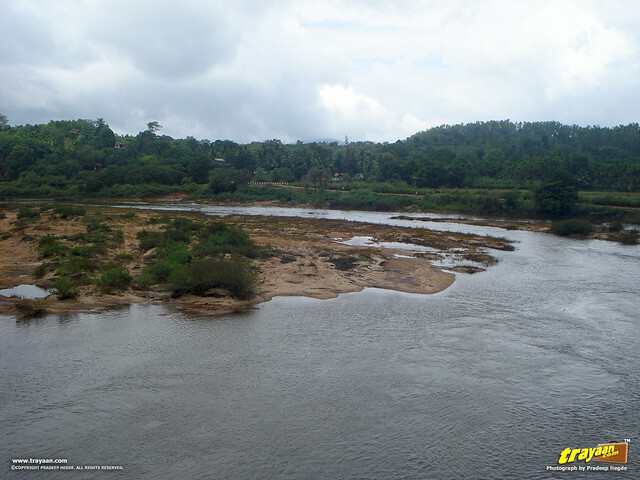 It is located on the banks of the river Tunga. Adi Shankaracharya also established mathas in all four corners - the north, south, east and west of India. 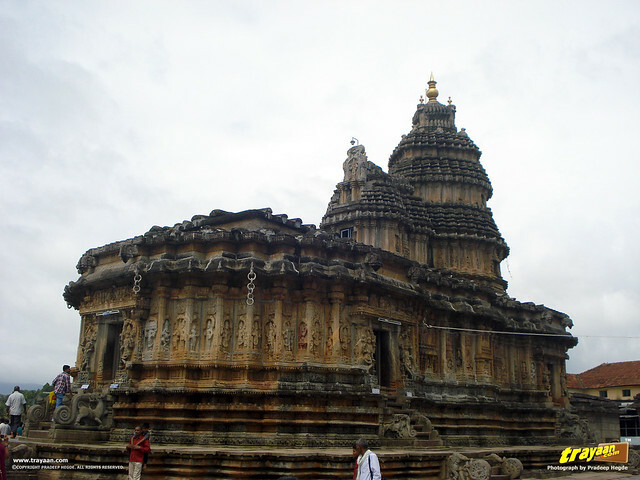 Starting from Mangalore, passing by Moodabidri and Karkala, then through the lush green surroundings and the blissful and misty Western Ghats, early morning in the rainy season, we arrived at Sringeri. Leaving our footwear at the stands, we entered into the temple compound. As we went in walking, the entrance to Sharada Temple was on the right, and we could see the Vidyashankar Temple straight ahead, besides the river Tunga. 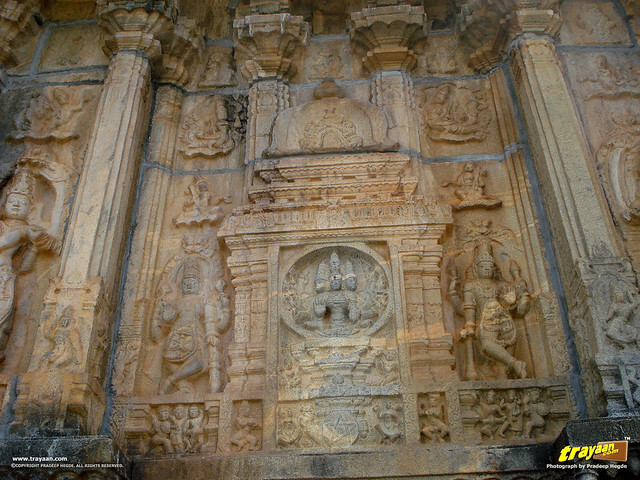 The Vidyashankara temple at Sringeri is a magnificent architecture, beautifully built entirely out of carved stone in around 1338 CE , in the memory of Guru Vidyashankara, by Vidyaranya who headed the Sringeri Sharada peetha from 1331 CE to 1386 CE and played an important role in establishing the glorious Vijayanagara Empire. 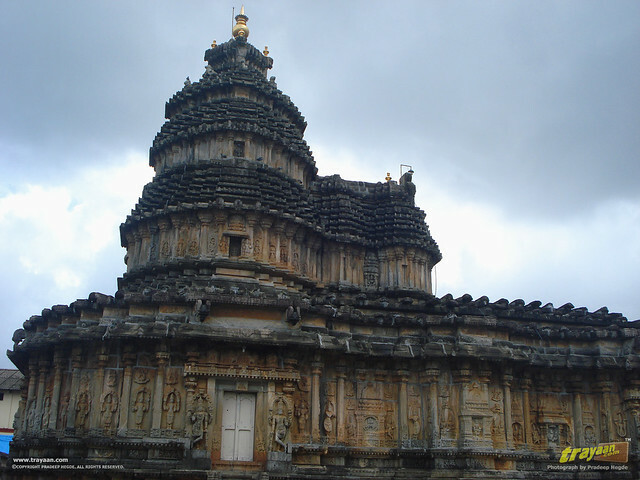 It was built with the aid of the Vijayanagara rulers, combining the Hoysala, Chalukya, and Dravida styles. 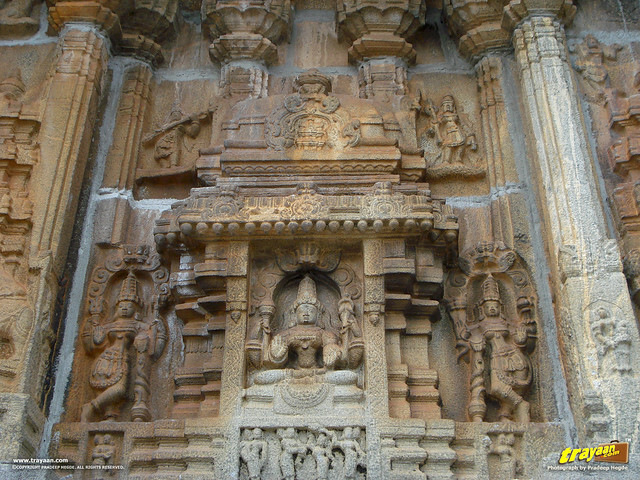 This temple is undoubtedly one of the fine monuments full of beautifully carved sculptures, and featuring a unique style, which looks like Hoysalan, if you see the walls and the raised platform or plinth on which it stands, which can be used for circumambulation (pradakshina). 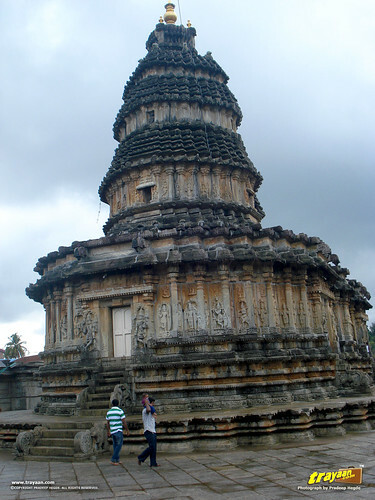 But the temple has curved sides like the temples in Kerala, or like the Chalukyan Durga Temple at Aihole. The peak of the temple features a different style altogether! The walls will remind you of temples at World Heritage site of Hampi, the capital city of Vijayanagara Empire. 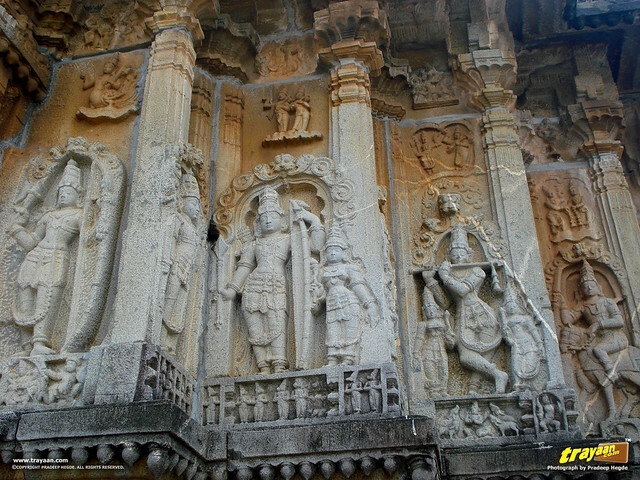 It is a unique and beautiful combination of different styles of Indian - South Indian temple architecture to be more specific, which probably isn’t found anywhere else. 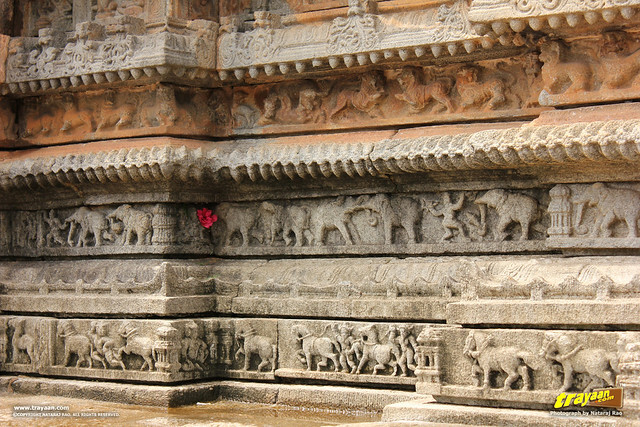 The outer walls feature relief sculptures of various scenes from the puranas (Hindu mythology), with animals like lions, elephants and horses all around the bottom. 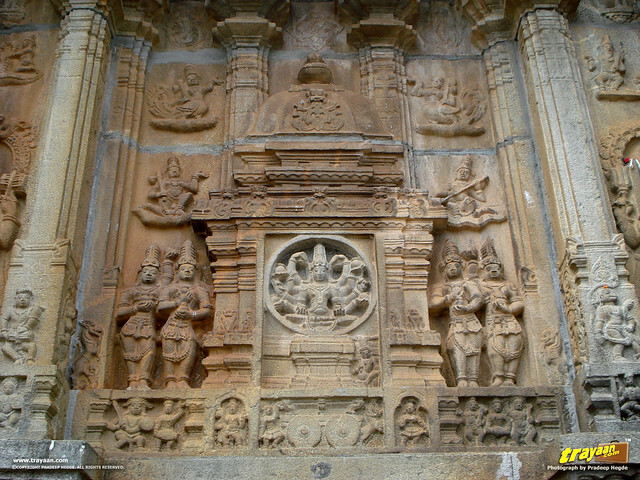 The rear side of the temple features the Dashavatara (Ten avataras or incarnations of Lord Vishnu). The twelve zodiacal pillars (called raashi-stambhas) inside the temple hall, on which are carved the twelve signs of the zodiac, are arranged in such a way that rays from the rising sun fall on each of them, in the order of the twelve zodiac. For example, if the Sun is now located in the constellation Capricorn (Makara Raashi), then the rays fall on the pillar with the Capricorn symbol. Unfortunately we do not have pictures of them as photography is prohibited inside the temple. So, let me emphasize on words this time. The floor has an elevated circle, which can be typically found in Hoysalan and some of Vijayanagar styled temples. This is however marked with converging lines which is said to indicate the direction of the shadows when the sunlight falls on the Zodiac pillars. The intricately carved ceiling shows excellent craftsmanship, which is also usually found in Hoysalan or Vijayanagar styled temples. Straight ahead, to the west, inside the temple, the garbhagriha or the main sanctum, houses Lord Vidya Ganapati on one side and Goddess Durga on the other. This temple is functional even today and photography is not allowed inside. 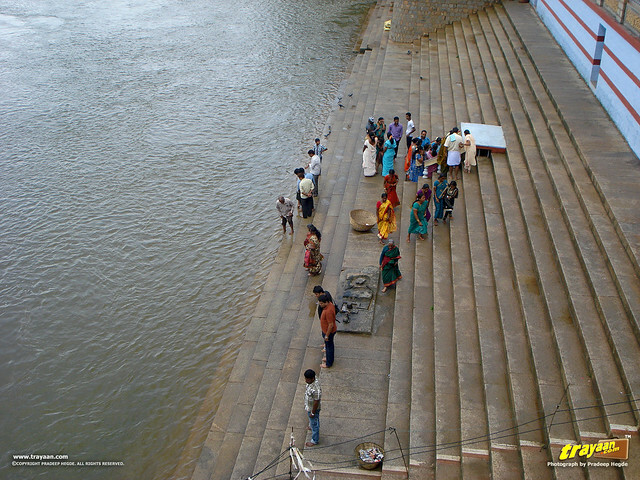 This temple lies on the banks of River Tunga. 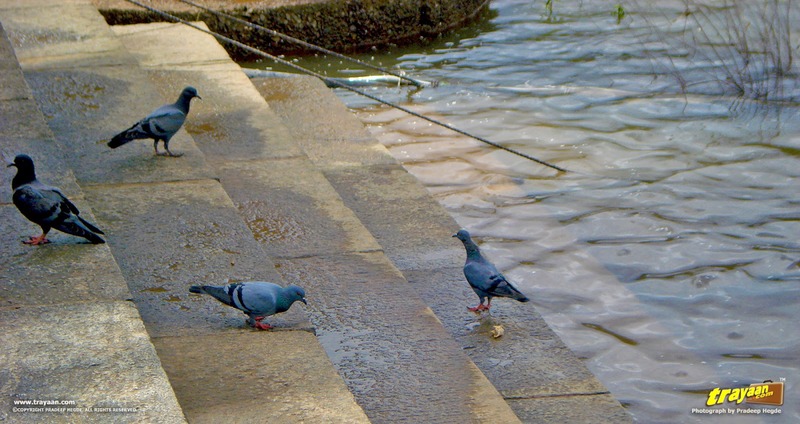 Lot of fishes come on the river edge, where the devotees feed it with puffed rice. They are said to be sacred fish, you are not supposed to catch it. As mentioned earlier, Adi Shankaracharya installed the image of the Sharada, or Sharadamba, the goddess of knowledge, and built a shrine. The originally modest shrine had an image of the goddess made of sandalwood. 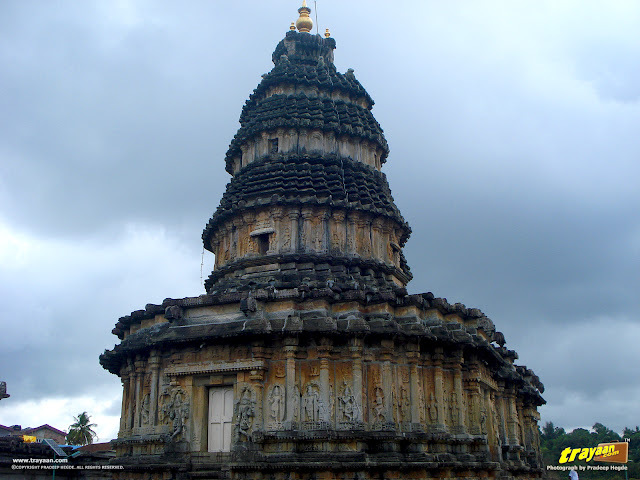 The temple was later built of wood, in the Kerala style with tiled roof. It was renovated with the current granite structure, with polished granite outer walls surrounding it in May 1916 CE. The main hall of this temple has huge stone pillars with carved deities on them. This temple does not feature much architectural style and intricate carvings or designs like the Vidyashankara temple, but is important to the devotees and pilgrims. Sri Vidyashankara Temple to the left, and Sri Sharadamba Temple to the right. Rest of the time, the temple remains closed, but you can see it from the outside. Footwear has to be left outside, before you enter the temple compound in the footwear stand. Better go as early as possible in the morning, as the entire area is paved with stones, and walking on those heated stones later in the day will bake your bare feet. The place is sacred to the believers and pilgrims. Do not consume alcohol, smoke or non-vegetarian food nearby the temple area and create nuisance. Also, fishing is prohibited in this area. Decent accommodation is provided at the Guest Houses run by the Sringeri Temple administration for the pilgrims and devotees. Here, accommodations are allotted on first come - first serve basis, and advance booking is not entertained. Also, traditional South Indian food is served everyday in the afternoon and at night, in the temple premises itself for the pilgrims and visitors. This serving of traditional vegetarian food as a service to devotees (Annadaanam)exists in most of the famous temples of this side, for example Horanadu, Kollur, Dharmasthala, etc. There aren't many places to stay nearby. The place is sacred to the believers, and alcohol, smoking, non-vegetarian food are prohibited in Sringeri Temple guest houses and most other lodges around. 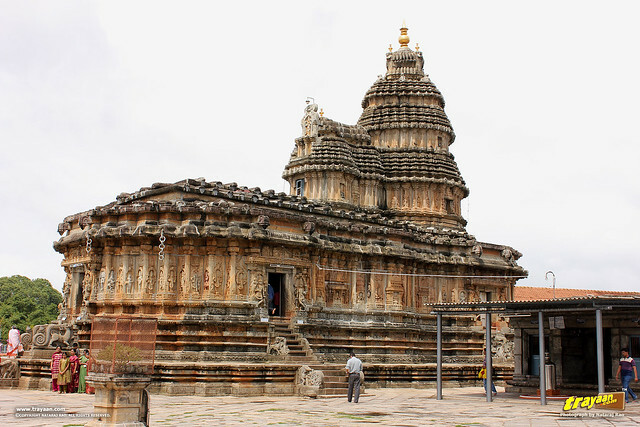 You can also travel to Sringeri as a part of your trip or tour when you are at Mangalore, Udupi or Chikmagalur which have several good accommodations. There are a good number of buses that ply to Sringeri from Mangalore, Udupi, Chikmagalur, etc. Hiring a cab or some 4 wheeler is a good option, as you can easily cover other nearby places of attractions worth visiting. Sringeri is about 87 kms from Chikkamagalur town, 108 kms from Mangalore (via Karkala), 81 kms from Udupi (via Agumbe route), and about 95 kms from Udupi via Karkala route. See below map for various routes and directions. During the winter, between October to February or March, before the summer heat begins. If you simply love the monsoon rains, go ahead in rainy season (around June to September). But keep an eye on the weather in the rainy season, as the Ghat section roads this time may be bad or get closed due to landslides and bad weather. Navaratri festival is grandly celebrated in Sringeri every year. It usually falls on the month of October. Check this year’s calendar for the exact dates, if you are interested in the cultural activities. 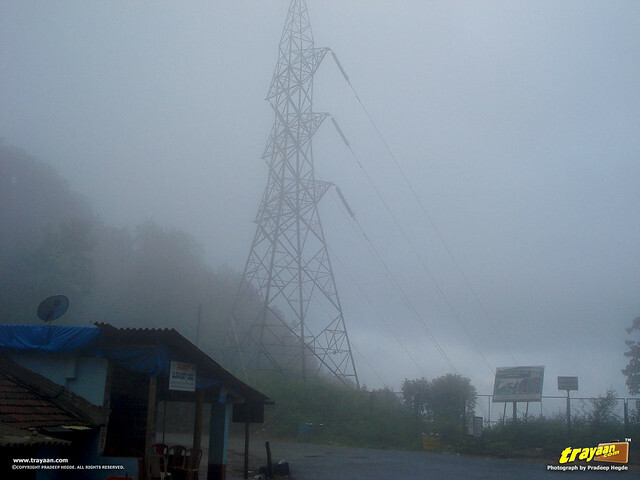 Agumbe – The sunset view point in Agumbe at an elevation of 643 m (2,110 ft) is a very popular spot. Chikkamagalur district features lush green mountains, waterfalls and landscapes. Mullayyanagiri, Kemmannugundi, Baba budangiri, Bhadra wildlife and river camps are some of the major attractions. 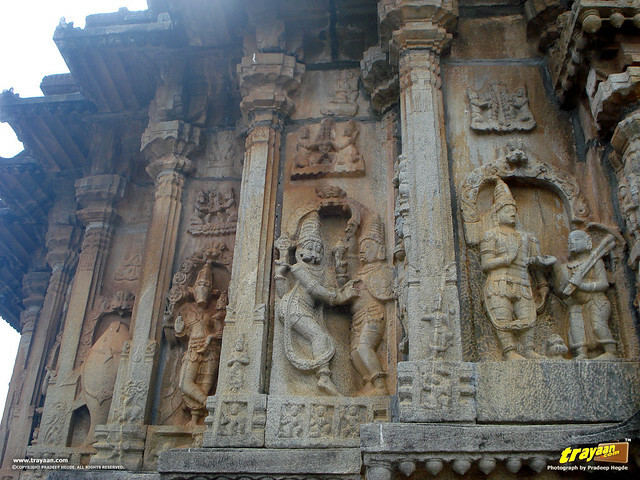 It also has some fine Hoysala Temples, for example the Amrutesvara Temple at Amruthapura. If you are interested in pilgrimage, then there are several popular pilgrimage temples of importance nearby, like Horanadu Annapurneshwari Temple, Kalasa Temple, Kollur Mookambika temple, etc. Have a look at the above map, where we have added some of the Places of interests in and around Sringeri, for your convenience. We will eventually add the places to the map which aren't listed currently. Hindu Zodiac on Wikipedia, the free encyclopedia.